Being an avid Only Fools and Horses fan from a very early age, watched all the TV series and even met some of the cast. I decided to tribute this great British comedy, by intensely recreating these classic vehicles, even down to the number plates, which I've acquired. As well as unique props like the Delboy brick phone, costumes and inflatable dolls. After many overwhelmingly fantastic comments on how authentic the vehicles are and many requests, I decided to hire the vehicles and stage events. So my enthusiasm for the Only Fools and Horses show and cast turned in to a business. This time next year we'll be millionaires!! The BBC News today report that David Beckham is joining Sir David Jason and Nicholas Lyndhurst for an Only Fools And Horses Sport Relief sketch reuniting Del Boy and Rodney for the first time in over 10 years. 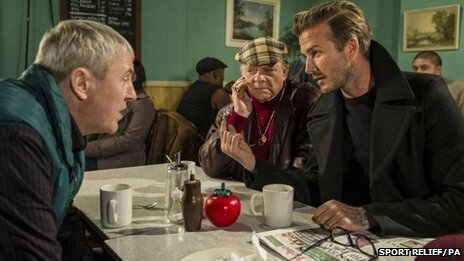 As part of BBC One’s Sport Relief coverage on 21 March, the sketch will see Beckham head to Peckham to join the duo in a greasy spoon cafe. The brief return of Only Fools and Horses has been eagerly awaited by fans of the show, which ran from 1981. It was regularly voted Britain’s best sitcom and the 1996 Christmas special Time On Our Hands, in which Del Boy came good on his ambition to turn the Peckham brothers into millionaires, was watched by more than 24 million people.